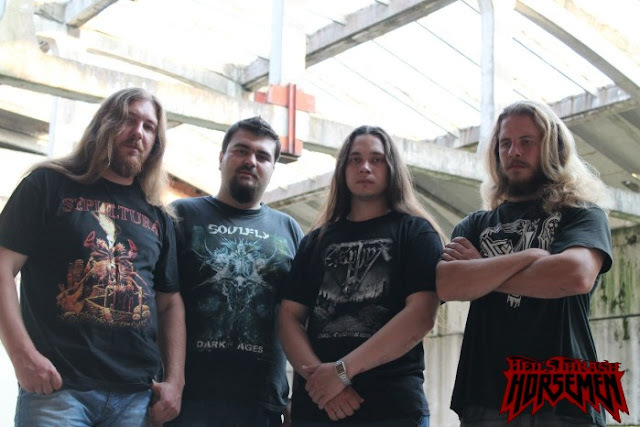 HELL’S THRASH HORSEMEN was formed back in 2007, in Smolensk, Russia, by guitarist Nick Komshukov. In September 2008 proceeded to recording their debut album, “…Till Violence”, which included 7 tracks . The first album was released on 19 March 2009 under Always At Records label. A series of gigs was done then in Smolensk and some other Russian cities, which were introducing a new live set, consisted of both tracks from album and brand new songs never played before. Since December 2009, the band began working on the new songs recorded for the full-size studio album “Going Sane”. This album was released on 06 June 2010, followed by a tour in some few Russian cities. There was a series of gigs throughout the fall / winter season of 2010 / 2011. During one of these gigs, HTH played warm-up for German band CONTRADICTION. End 2010 – beginning of 2011 was marked by reissuing of the band’s debut album “…TILL VIOLENCE” on the Brazilian label HOLOCOUST Prod. That album’s been produced as a split together with the Brazilian thrash band, RATTLE, and was named PAIN IS INEVITABLE. In spring 2011, the band received an offer from the Malaysian label to record a cover version of the Malaysian band SILENT DEATH. This offer has been gladly accepted, and right off in May a cover version of “MORBID MASSACRE” has been already done. Meanwhile, the band has been staging gigs all the time, finally appeared on stage in late August at one of the major international annual music event, METAL CROWD FEST, that traditionally takes place in Rechitsa, Belarus, staging together with BATTLELORE and CATAMENIA. In fall 2011, the band began working on a 4-song record at a studio, which will be included in the band’s 3rd album.